I will be heading out next week for our annual vacation in Bodega Bay for crab season so I am not sure how much video taping I will be able to do so I have set up several cards to post here for you - just in case I don't get any taping done. You can consider them my 12 Days of Christmas but they will be stretched out during the month of November to give you inspiration in creating your own cards this holiday season. I have to sneak this one in right away since Halloween tomorrow! 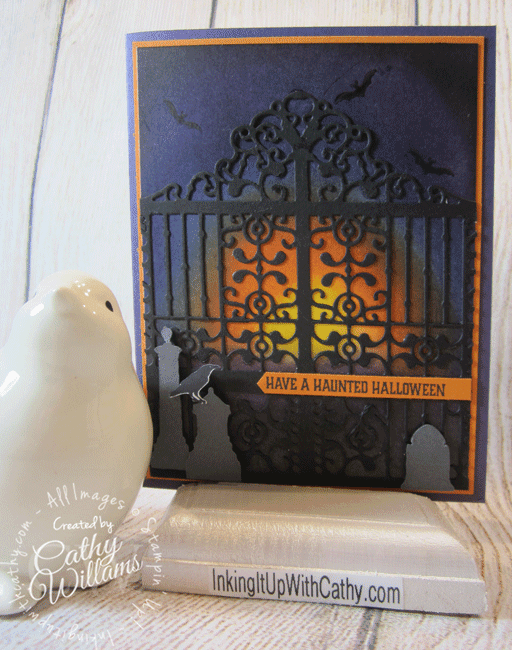 I love this gate die and can think of so many uses for it but we will start with the obvious - just an iron gate on eerie night! I started by sponging in the Daffodil Delight center, then worked out from there with Pumpkin Pie, Night of Navy, Eggplant Envy and finally Basic Black in the upper corners. At the bottom I used Eggplant Envy and the Basic Black. I added a few flying back and then placed my gate on the card front. 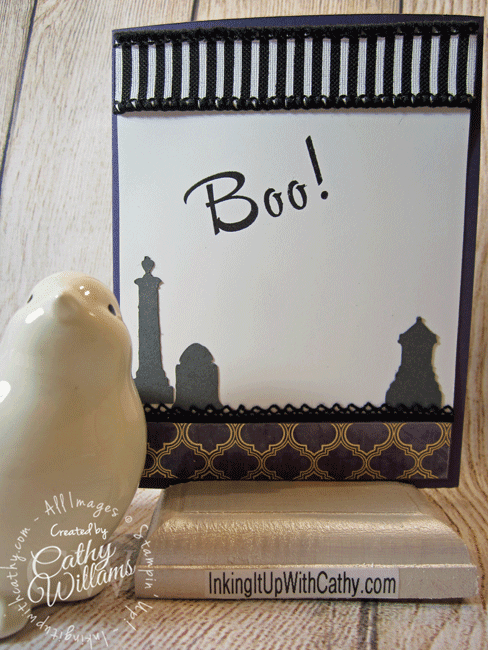 The headstones were stamped in Basic Gray on Smoky Slate card stock. I purposely had the ink pad a bit on the dry side so it wasn't full coverage. This made it appear more textured like a headstone would be. A raven was stamped in Basic Black on Whisper White and cut out using my Scan N Cut. 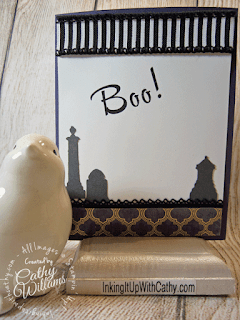 The sentiment was stamped in Eggplant Envy on Pumpkin Pie and trimmed to create a point. 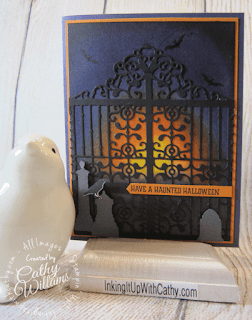 Here on the inside of the card, I placed more headstones and stamped the Boo! from the Brushwork Alphabet set. That black & white ribbon at the top? Nope, wasn't planned but I got a black smudge at the last minute and didn't want to redo the entire piece so I just covered it up! I love being able to find solutions to problems like this instead of starting over.